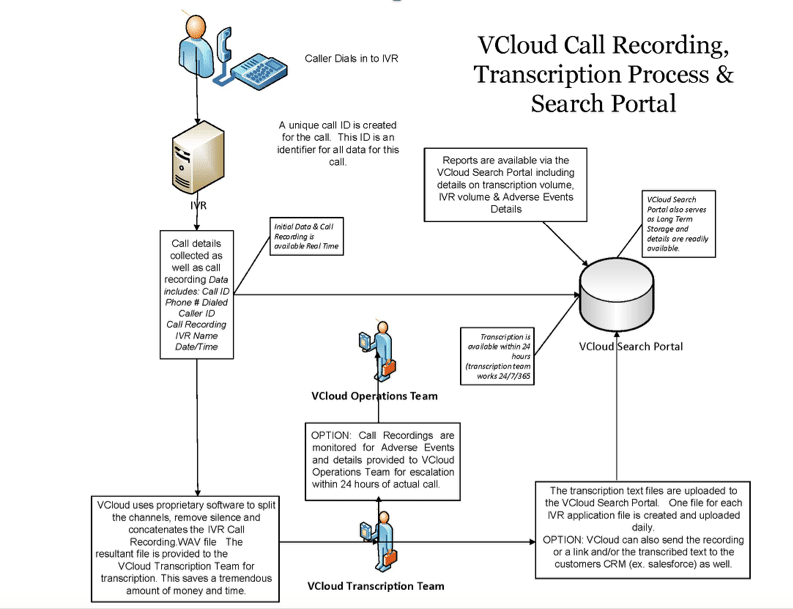 Whether you choose our human transcription or our automated software transcription, VCloud will deliver the most accurate, quickest turnaround times in the industry. Our pharmaceutical and healthcare clients demand complete accuracy and speedy turnaround times for transcribing calls/IVR/agent talk time and for reporting on adverse events. We sign up for the highest accuracy and < 24 hour turnaround times with several of the largest companies in the world and will do the same for you. Overflow Services for in-house Agents! Vcloud can provide significant benefits to your customers by offering overflow services for times when all agents are busy or around the clock, 24/7 ( including holidays) transcription. Many of our clients use our services to capture and transcribe personal information that demands perfect accuracy such as name, address, email. Transcribe your voicemails and immediately send you the results via email. Enable your clients to open tickets, add notes to tickets, get the status of a ticket or shipment, leave comments of their own, verify account or billing information etc. Essentially you are phone enabling your data and our system will follow the exact same “verification” process that your live agents follow before allowing them to access the data. Remove & Automate Your Simple Repetitive Calls! A key benefit of VoiceCloud’s service is to remove and automate the simple repetitive calls, allowing agents to handle the more interesting, varied and complex calls. my bill sent via email. Angeles, CA 90001 | jsmith@gmail.com | Are these pants available in blue or green? John Smith | 3678913 | 212-555-1212 | jsmith@gmail.com | Flowers and chocolates not delivered and I need status. Can I add balloons and chocolate to this order? The flowers need to be delivered during office hours.